Alex Shaw is a member of the International Thriller Writers organisation, the Crime Writers Association and the author of the Aidan Snow SAS thrillers. Alex, his wife and their two sons divide their time between homes in Kyiv, Ukraine and Worthing, England. I was living in Kyiv and as I didn’t have a television I’d started reading a lot, thrillers generally. It struck me that no one was writing about Ukraine; they kept using Moscow as a location. I suddenly thought to myself, ‘these authors are experts on the spies and the SAS, but I’m an expert on Ukraine.’ So I decided I’d write about spies and the SAS in Ukraine. And Aidan Snow was created. 2. What drew you to write thrillers? Simple answer, you write what you like to read and I like to read thrillers. My main writing influences, for varying reasons, are August Strindberg, Tom Clancy, Vince Flynn, Lee Child and Stephen Leather. Yes. I spent a year trying to get a traditional deal and had some good feedback before I discovered self-publishing. Five years later, after self-publishing several more books, getting good sales and in essence learning how to write I tried again. I approached five publishers and two made me offers. My Aidan Snow novels are now published by Endeavour Press and Amazon Publishing has contracted me to write a novella for Kindle Worlds. 5. There are many interesting characters in your novels; do you have a particular favourite one? I have a soft spot for Director Dudka the cantankerous old SBU (Ukrainian intelligence agency) officer. I’ve given him his own novella but I’d love to write a stand-alone Dudka novel. Apart from the usual internet research I speak to ‘friends’ in Ukraine and try to visit the locations I write about. On many occasions I actually write on location. 7. Are the characters in your books based on any real lifepeople? One of my reoccurring characters is based on someone I know, and of course I do reference real world politicians (although I don’t use their actual names). 8. What do you think makes your novels stand out from all the other thrillers out there? Locations and characters. No one in my genre is writing in depth about the country I love – Ukraine, and the people I’ve met there. Aidan Snow is me if I’d been in the SAS, which is why we share the same initials. I’ve got a thriller and a crime novel planned for this year. Both will be different from my previous novels. The hero of the thriller is a Russian ‘sleeper agent’ and the hero of the crime novel is…you’ll have to wait and see! I’m also going to write the second and third ‘Jack Tate’ novellas for Amazon’s ‘Kindle Worlds’ and the second Delta Force Vampire novel. A fourth Aidan Snow thriller is planned for 2016. 11.What was your favourite scene to write in your latest novel COLD EAST and why? I don’t have one favourite scene but I do like those which have Dudka in them. What he says always surprises me and I plan to feature him more in my next Aidan Snow thriller. 12. Can you tell us a little about your latest book? I’ve actually got two new releases, a novella for Kindle Worlds called BLACKLINE and the third Aidan Snow thriller – COLD EAST. 13. Do you have any words of advice you can share for new or would be authors? The biggest issue facing any would be writer is not ‘writer’s block’, its ‘writer’s procrastination’. The only way you are going to write a book is if you actually start to write it. Read the genre you are writing in, read all the hints and tips for writers you can but then write your book. Writing used to be a very lonely process but now with vibrant writing communities on Facebook and twitter this is a thing of the past, but again don’t become a victim of ‘writer’s procrastination’ by living on social media. Quintin Jardine is one of Scotland’s best-loved crime writers, with over forty novels and three series to his name. His latest, Last Resort, is the 25th installment in the Bob Skinner series, and sees the former Edinburgh Chief Constable attempting to take a break and consider his future whilst relaxing in Catalunya. Hailed as ‘the new Ian Rankin’ by the Daily Record, James Oswald’s first two Inspector McLean novels were shortlisted for the prestigious CWA Debut Dagger Award, leading the Sunday Telegraph to call him ‘Crime Fiction’s next big thing’. The fifth book in this well-established series which expertly blends the scientific with the occult, Prayer for the Dead sees our Inspector investigating a macabre ritualistic murder, in a mysterious network of caves and passages beneath Edinburgh’s streets. Going back to my days in the Police I had always fancied writing a novel based on my experiences but the time had just never been right while a change of career into sports journalism meant the idea had to be shelved again. In 2007 my appendix burst and I knew then that the recovery period had presented me with the perfect chance to give it a go. What drew you to write crime novels? Having 12 years police service behind you is enough to provide anyone with a treasure trove of ideas, characters and experiences from which to draw upon when it comes to a novel and not to use them would have been almost a case of neglect. I am keen, one day, to diversify into historical writing, as history is my great passion and my degree is an MA Hons in British, European and Scottish Medieval History, but that is for later…I hope!! I am a big Bernard Cornwell fan and although he is not a crime writer, his style of writing is all about colour, characters and action. His books are real page turners and hopefully so are mine! In terms of crime fiction, for me Colin Dexter’s Inspector Morse is the ultimate. Getting published was a nightmare! The first problem is to get an agent as you won’t get a publisher without one. Despite being told my debut novel was like a cross between Life on Mars and a Martina Cole novel, I failed to get a deal and eventually it was 2011 before I got published..four years after I had written the original version of Parallel Lines: The Glasgow Supremacy. There are many interesting characters in your Novels, do you have a particular favourite one? I tend to like the bad guys. Right now I have just finished the first draft of my fourth book “The Shift” and the bad guy there is Bobby “Mojito” Dawson. The visual prompt for his character comes from a painting in Glasgow’s famous One Devonshire Gardens Hotel that hangs above the fire in the whisky snug and his nickname comes from my favourite holiday cocktail! What kind of research have you had to undertake for your Novels? Because I have so much experience in “crime” I am pretty lucky in that respect. But in my second novel “The Hurting: The Glasgow Terror” the story is set around a terrorist attack on Glasgow and I did have to do a fair bit of reading on terrorists etc. While my third book “The Longest Shadow” drew its inspiration from the wartime murder of Gertrude Canning, which I am confident is still the subject of an establishment cover-up that perpetuates to this day. So it all depends on the theme of the novel. Of course, because the type of people I met in “the job” were just too interesting and colourful not to use. But I tend to make my book characters hybrids of two or three people rather than based on just one single person. What do you think makes your novels stand out from all the other Scottish Crime Fiction Novels out there? Real life experience. If you like your crime thrillers action driven with characters that are believable and full of betrayal heartbreak and revenge it’s time you met Gus Thoroughgood!! Thoroughgood’s love of music is very much mine but apart from that…well that would be telling!!! If you can, would you give us a sneaky peak into any future novels you have planned? My fourth book “The Shift” is due out in November and is set in 1989. 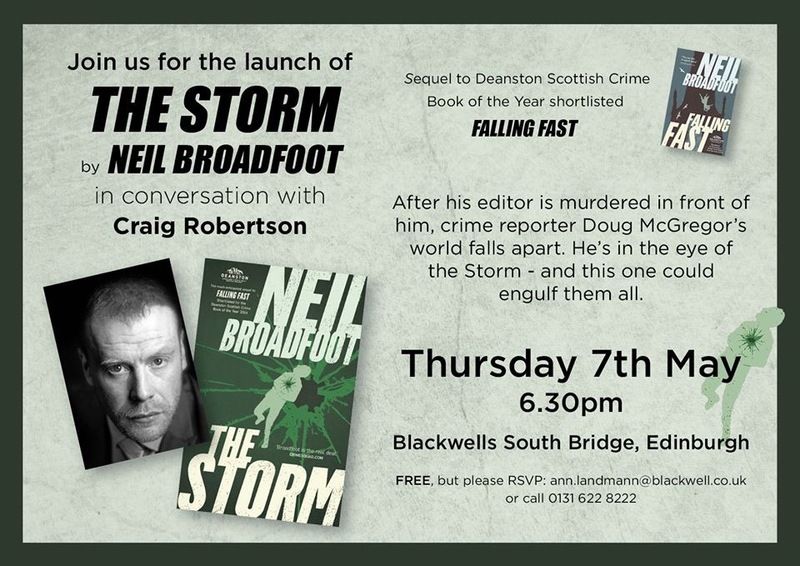 It draws heavily upon what happened to me as a rookie cop just graduated from Glasgow University and also draws upon Glasgow’s infamous Ice Cream War. Out of all the Novels you have written do you have a favourite one that stands out to you? I like “The Longest Shadow”, which is the third in the Thoroughgood series. As I mentioned earlier the inspiration for it was the 1942 murder of Gertrude Canning and I just found that fascinating material from which to pen my own novel. As an up and coming crime writer do you have words of advice you can share? Second in the Von Valenti series, where the action moves to Edinburgh. A professional hit during an executive paintball game demands all of Von’s skills as a detective. Leaving the Police and chasing her errant daughter, Von has relocated to Edinburgh where she’s set up as a Private Detective. She is asked to investigate a professional hit, an infamous ‘double tap’, that has occurred during an executive paint-ball game. As always nothing is as it seems as Von must use all her intelligence, tenacity and skills to unravel the truth from a web of lies that surrounds the case. Hania Allen was born in Liverpool of Polish refugees. She always wanted to go into space and came a fair way (but not far enough) in the Project Juno competition to find Britain’s first astronaut. Her career in education culminated in information management at the University of St Andrews, a post she left to write full-time. When not writing, she plays the piano with her musically gifted godchildren, making up for in enthusiasm what she lacks in talent. Hania has lived in Scotland longer than anywhere else and loves the country and its people, despite the nine months of rain and three months of bad weather. She currently resides in a fishing village in Fife. Join us to celebrate the publication of Last Resort, the 25th instalment in Quintin Jardine’s bestselling Bob Skinner series. After thirty years of service, former Chief Constable Bob Skinner faces the possible end of his police career, at its pinnacle. A quiet trip to Catalunya to contemplate his future soon takes on a different flavour when Skinner is approached by an old friend, media owner Xavier Aislado, with an unusual request. One of his business’s brightest talents, Hector Sureda Roca, has vanished without a trace. Now it’s up to Skinner to track him down. But as he conducts his search it soon becomes clear that another manhunt is also in progress, and that he himself is the target. While his daughter Alex fights that battle on the home front, his search for Sureda takes one sinister turn after another, until he is faced with the toughest question of all. Is natural justice sometimes the only answer? Quintin Jardine was born once upon a time in the West: of Scotland rather than America, but still he grew to manhood as a massive Sergio Leone fan. On the way there he was educated, against his will, in Glasgow, where he ditched a token attempt to study law for more interesting careers in journalism, government propaganda, and political spin-doctoring. After a close call with the Brighton Bomb, he moved into the riskier world of media relations consultancy, before realising that all along he had been training to become a crime writer. Now, more than forty published novels later, he never looks back. This event is ticketed, but tickets are FREE.